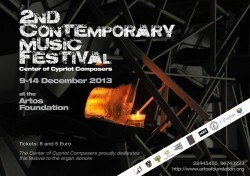 Home Archive by category "new events"
The 2nd contemporary music festival organized by the Center of Cypriot Composers. 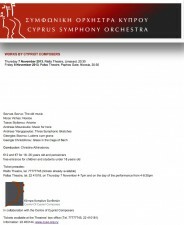 Tasos Stylianou “Bird Funeral” written for a selected ensemble from the youth orchestra, Lecture on Xenaki’s N’Shima, “Fossils” for piano, and “Worms and Butterflies” for flute, clarinet, piano, and accordion . Copyright © 2014, Tasos Stylianou. All Rights Reserved.